OXFORD TWP. - Tracking dogs sniffed, horsemen trampled alongside cornfields and hundreds of volunteers scoured the landscape in a six-month search for missing Miami University professor Charles Capel - to no avail. Wednesday, a lone hunter spotted bones in a desolate wooded area just a mile from Capel's Oxford home - and about 100 yards from where volunteers quit their last search. Investigators said they think Capel, 81, tripped and fell in the wooded area encircled by a cornfield and was unable to get back up. "He must have been really concealed by the foliage and the trees, because where he was found was just outside the grid area of our last search - and that area was part of our original search," Sgt. Jim Squance, city police spokesman, said Thursday. Authorities will perform an autopsy on his skeletal remains today, although they might never know what killed the beloved retired mathematics professor. But for the family that cherished his empathy, intellect and jovial spirit, the discovery brings an end to a mystery that galvanized many in this Butler County city of 22,000 and focused attention on the painful plight of families like Capel's whose loved ones have Alzheimer's disease. "With Alzheimer's, you lose your loved one while they're alive. You don't have the relationship you once had with them, and it's very, very hard," Capel's daughter, Gail Capel Stephenoff, 48, said in an interview from her home in Hilliard, near Columbus. "We are relieved that he's been found. It brings us the closure that we've prayed for," she said. "Just kind of knowing a little more about where he went - and that he died peacefully." Capel, suffering from memory loss and confusion, apparently wandered away from home sometime between 10 p.m. May 20 and 8 a.m. May 21. June Capel, his wife of 58 years, alerted authorities when she awoke and found him missing and the door to their white brick ranch home wide open. Capel, the father of two daughters and three grandchildren, enjoyed walking for fitness, and his wife said at the time that she thought he might have gone for a walk that morning and become disoriented. "I want to believe that Charlie went for a walk that morning ... made a wrong turn and got lost,'' Capel's wife said in June. "We may never know." In the months that followed his disappearance, hundreds of volunteers and police repeatedly scoured a 10-mile radius from the house. The last search, Oct. 24, focused on an area within a mile of Capel's home - perhaps 100 yards shy of the site where Capel's remains were found, police said. "That area looks much different now than it did back when he first disappeared," Squance said. In late May, trees and bushes were lush with leaves; by midsummer, tall green cornstalks encircled the heavily wooded clump where Capel's remains were found. "It's kind of sad that we missed it. But it's not for lack of trying or the community effort," Squance said. About 4:30 p.m. Wednesday, in the now-barren, brown landscape of late fall, hunter Jason Long crunched along the fallen dead cornstalks. He spotted what appeared to be an animal carcass. As Long got closer, he realized that the skeletal remains appeared to be human, and he called police. 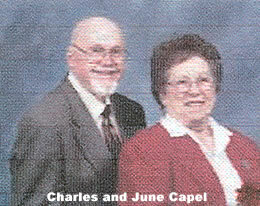 Right away, investigators suspected the remains were Capel's, Squance said. "We had no other missing person...and it's not that far from his house," he said. The remains were found atop a log, along with a shirt; a pair of gym shoes were nearby. "There is some indication that he may have tripped," Squance said, declining to elaborate. The area in which Capel's remains were found was similar to descriptions that "psychic detective" Noreen Renier, of Virginia, had given to police who enlisted her help when they were stymied by a lack of clues in the case, Squance said. "The landmarks she described were all there," he said. Renier told police she thought Capel had gone out his front door, walked along Contreras Road and through a field where tall grass or plants were itching his legs, Squance said. Renier also said she "saw" a tower with a radio antenna on top - similar to the water tower within sight of the spot where Capel's remains were found. "We based our search on the information that she gave us, and, as it turns out, she was right on," he said. 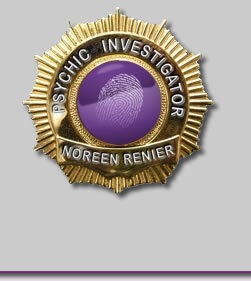 "Professionally, you have to be a little skeptical, using a detective psychic. But personally, when you see the results, you've got to be in awe." There were times when, despite everyone's efforts, Capel's loved ones feared he'd never be found, his daughter said. "We're very grateful to all the authorities and search teams," she said. "My father was a wonderful, wonderful man, and I miss him a lot."